Here you can find all info about Burning Desire from Gage Green Genetics. If you are searching for information about Burning Desire from Gage Green Genetics, check out our Basic Infos or Lineage / Genealogy for this cannabis variety here at this page and follow the links to get even more information. If you have any personal experiences with growing or consuming this cannabis variety, please use the upload links to add them to the database! Burning Desire is an indica/sativa variety from Gage Green and can be cultivated indoors (where the plants will need a flowering time of ±60 days) and outdoors. Gage Greens Burning Desire is/was never available as feminized seeds. The White Fire hybrid spread across the cannabis scene around the same time that Gage Green Group began to work on the Grape Stomper OG hybrid. Both are immense resin producers. The Grape Stomper OG produces thick and taller trichomes while the White Fire produces extremely white and glistening trichomes. Combined, the results truly speak for themselves. Grow tests of the Burning Desire revealed a growth tendency towards OG Kush bud structure. Tight bundled calyxes stacked on top each other creating potential for completely new flavors and medicinal effects. Growers who explore the phenotypes in this hybrid will be rewarded with connoisseur buds with all the desireable characteristics of the White Fire and the Grape Stomper OG. Expect the unmistakeable grape aroma to blend with the chem and kush of the OG. 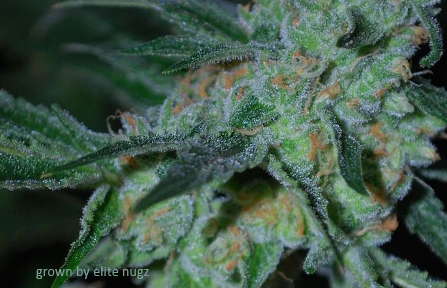 A range of effects from body-relaxing to mind-stimulating can be discovered in these buds. This hybrid is a must have for those who crave pristine buds that pack a punch. Click to show all parents of Burning Desire in our dynamic family tree map. Do you know something more about Gage Greens Burning Desire? Please help to make this database better and upload/connect your information here! Pictures speak louder than words! Upload your "Burning Desire" Photos here and help other growers to get a better impression of this variety. You have grown Burning Desire together with another variety? Please fill out our Strain VS. Strain direct comparisation form! Our strain reviews are multilingual, searchable and can be very detailed - including data about the grow, aroma, effects and taste! Please upload your Burning Desire Review here to help the other seedfinder users! You have experience with the medical qualities of Burning Desire? Sharing your information here maybe can help other people! You've stumbled upon a Burning Desire related thread into a forum or growers community? Connect it here and enable othe users to find this information fast and easy! You found a related video with additional information or grow-infos about Burning Desire on YouTube? Please connect it here to the strain info page!